To progress from an L to P1 licence you must pass the Hazard Perception Test, which is a computer-based test that measures your ability to recognise and respond to potentially dangerous situations and react appropriately. Research has shown that a lack of these skills is a major factor in crashes involving young novice drivers. A Hazard Perception Test can be booked, by telephoning 13 10 84, and undertaken in any Customer Service Centre. A fee is payable for each attempt. If you live more than 100 kilometres (as the crow flies) from a place where the test is conducted, or on Kangaroo Island, you are exempt from having to sit the Hazard Perception Test. For Hazard Perception Tests at Service SA, bookings are required. Telephone 13 10 84 for further information. You can practise the Hazard Perception Test on-line. If you fail a practical driving test, you are not allowed to do another practical driving test for at least 13 clear days. This is to allow you to practise your driving skills in preparation for the next practical driving test. Alternatively, you may complete the Competency Based Training & Assessment (CBT&A) method instead. After passing a practical driving test or completing the Competency Based Training & Assessment, a Certificate of Competency will be issued to you by the Authorised or Accredited Instructor. You can then apply to be issued with a licence that is subject to provisional licence conditions (a P1 provisional licence). To apply for your P1 provisional licence, you must present the Certificate of Competency and your completed Log Book (75 hours of supervised driving) and declaration at a Customer Service Centre, together with the appropriate fee. The Certificate of Competency does not authorise you to drive. Only when you have obtained the P1 provisional licence are you authorised to drive while under P1 provisional conditions. A provisional licence is issued for 3 years, 1 year on P1 and 2 years on P2. 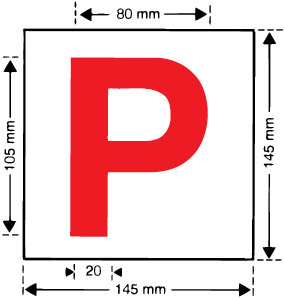 The minimum size for the 'P' plate sign is shown in the diagram right and consists of a red letter 'P' against a white background. The sign must be displayed and clearly visible from the front and rear of the vehicle (rear only for motorcycles). 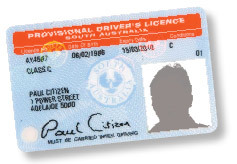 Provisional driver's licence laws and conditions (P1 and P2). you must not use any function of a mobile phone including hands free mode, blue-tooth technology and loudspeaker operation. You will automatically progress to a P2 provisional licence after you have held your P1 provisional licence for 12 months. Please note; these changes apply to provisional licences gained on, or after, 28 July 2014. If you obtained a licence before that date your individual circumstances may vary. Please telephone 13 10 84 for details. Also, if you are under 25 and hold a full licence the high-powered vehicle restrictions do not apply.